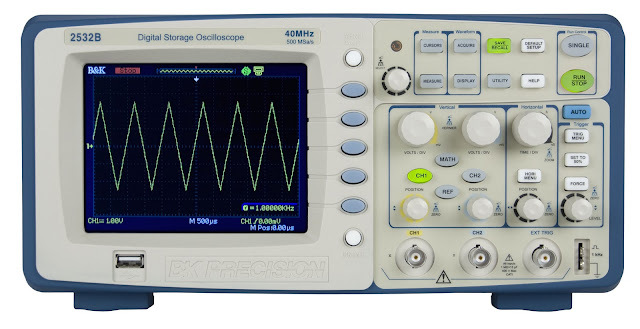 B&K Precision has replaced their model 2532 digital storage oscilloscope (DSO) with the 2532B 40 MHz DSO. This new compact DSO offers basic measurement features with a 500 MSa/s sampling rate, and improves upon the 2532 without compromising quality or cost. The 2532B provides technical schools, electronics manufacturers and service organizations a DSO with great performance at an economical price point. Noticeable improvements to the 2532B against its predecessor include its lightweight and portable form factor, along with increases in waveform memory from 4,000 points to 32,000 points, and total number of automatic voltage and time measurements increase from 11 to 32. 2532B users can save and recall up to 20 different oscilloscope setups and 10 different waveforms from internal memory. This DSO also supports five math operations –addition, subtraction, multiplication, division, and FFT. Like its 2530B cousin, the 2532B features a bright 5.7” color display, advanced triggering capabilities, pass/fail testing, digital filtering and remote PC connectivity. A USB device port is provided on the front panel to quickly save setup and waveform data, screenshots, or CSV files to a USB flash drive. Other features include a waveform recorder, context-sensitive help feature, multi-language interface, and the ability to disable the Auto Set button for educators. Available immediately, B&K Precision's 2532B 40 MHz DSO is listed at a price of $599.